NeOn Movies - A collection of more than 30 videos detailing the key features of the NeOn Toolkit, the different plugins available for it and applications of NeOn technologies in the fisheries and pharmaceutical domains. Note: The links to the movies will be progressively updated. NeOn Methodology Handbook 2009 - The NeOn Ontology Engineering Methodology Handbook, to be published in September 2010, provides a complete reference for ontology practitioners to engage in the engineering of networked ontologies. It includes guidelines for the many activities in ontology engineering, as well as description of concrete applications of this methodology and of NeOn technologies from the NeOn case studies. NeOn Highlights 2009 - NeOn Highlights provides an insight into our research and the motivations of the partners and people working in the NeOn Project. In the latest edition readers can find information about recent awards for some of the partners, as well as short story about new release of the NeOn Toolkit. NeOn Highlights 2008 -‘NeOn Highlights' provides a window onto the project's achievements and developments to date, with the launch of the open source version of the NeOn Toolkit, release of the Watson and Cicero plug-ins and the hosting of the NeOn Glowfest series of community-building events, to name but a few. 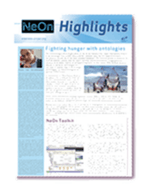 NeOn Highlights provides an insight into our research agenda and the motivations of the partners and people working in the NeOn Project, including interviews with case study partners The Food and Agriculture Organization of the United Nations and Laboratorios Kin. 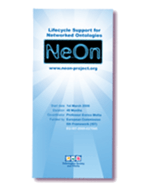 NeOn Toolkit Leaflet - The 'NeOn Toolkit leaflet' provides a general overview of the NeOn Toolkit, of its key features and of the important links related to the tool. NeOn Case Study Leaflet - The 'NeOn Case Study leaflet' summarizes the three case studies in the NeOn project, including the development of a stock depletion assessment system in the domain of fisheries, and tools for data interoperability for financial transaction and product description in the pharmaceutical domain. 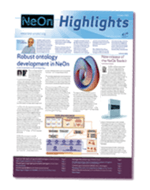 NeOn Technology Highlight Leaflet - The 'NeOn Technology Highlight leaflet' describes some of the key technologies developed in the project, including tools for ontology engineering and supporting the development of next generation semantic web applications.